Tauroctony 593 – Mithraeum. Our Common Sun. 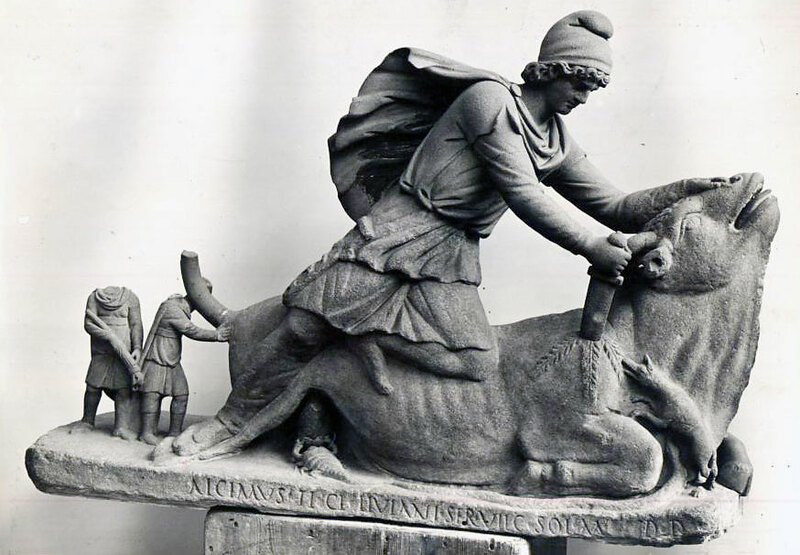 This is the earliest Mithraic monument showing Mithras slaying the bull. Statue of coarse grained marble (H. 0.78 Br. 1.07). At first in Rome, afterwards in the Townley Collection, nowadays British Museum. Mithras, slaying the bull. Three ears come out from the wound, the dog and the serpent direct their heads towards them. Behind the bull, on the ground traces of the legs of a bird (probably the raven). The two torchbearers are standing behind the bull; their heads have got lost. Cautopates points his torch downwards with both hands; Cuates holds his r.h. against the bull's tail, holding a torch with his upraised l.h. Restorations: upper part of Mithras' body from the belt, except the r. arm and the front part of the l. arm. Horns, ears and the front piece of the bull's muzzle. The inscription tells us that it was dedicated by a certain Alcimus, steward of T. Claudius Livianus. Vermaseren and Gordon believe that this Livianus is a certain Livianus who was commander of the Praetorian guard in 101 AD, which would give an earliest date of 98-99 AD.